The purpose of the HSNM Family Coop is to provide both a peer community and multi-generational community for families who are raising children without religion. 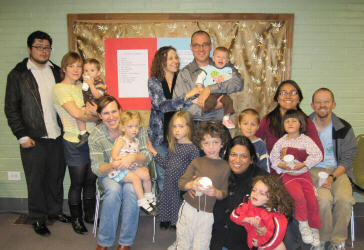 The focal point of the HSNM Family Coop is a Humanist Children’s Sunday School, which is managed by a team of Family Coop and general HSNM members and leaders. Funding and ongoing assistance with organizational and logistical issues are provided by HSNM. We strive to provide Humanist Children’s Sunday School classes once a month at a time and location that best serves the majority of participants, for periods of several months at a time. “Lessons” are oriented around experiential learning and guided play, using science and art projects, music, drama, and storytelling, led by parents, HSNM member volunteers, and invited guest teachers. Parents have access to numerous online resources as well as an accomplished and diverse local community of HSNM members, as they learn more about humanism, cultivate their own humanist home culture, and instill ethical principles in their children. We envision our Family Coop as a refuge for families grappling with a mass media, popular culture and politics that are still highly influenced by religious belief, often muddled by pseudo-science, and generally more focused on self-promotion than education or cultivating individual wellbeing. Membership in HSNM is not required for those participating in the Humanist Children’s Sunday School, but is strongly recommended. An annual household HSNM membership costs $30 and entitles two adult members of the household to all membership privileges, such as voting in HSNM elections, serving on our Governing Board and chairing HSNM committees. Having more Family Coop participants on our HSNM membership roster provides better representation for families in our decision-making process. The HSNM enrollment year runs from September 1 through August 31, but we accept new members year round.